Gabe Noyalis last pitched in 2012 and hopes his new found determination and 98 mph fastball will make an impression this spring. Last month the Toronto Blue Jays addressed their pitching need at the minor league level by signing seven arms to deals. While names like Brad Penny, Wade LeBlanc, and Pat McCoy highlighted these signings. There’s another intriguing guy in this group in right-handed pitcher Gabe Noyalis. What makes the Noyalis signing unique is the fact that he hasn’t played organized baseball since 2012 when he was a student athlete at division 3 Misericordia University. Spending the majority of his time since then as a Sales Associate and finishing his Bachelor Degree in History and Government. It appeared that Noyalis was done with baseball. But like many with a dream Noyalis wasn’t ready to hang up his cleats for good. After all, the righty found success in college. 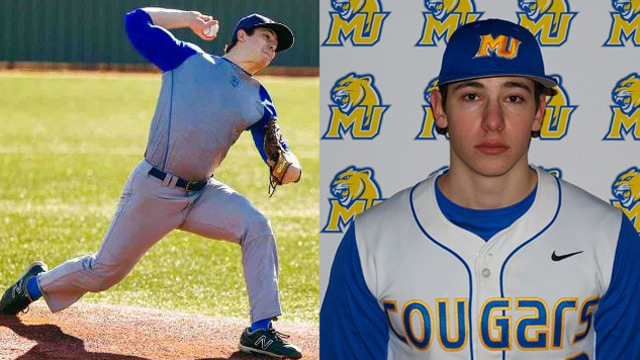 Maintaining a 1.88 ERA and 1.02 WHIP in his 38 1/3 innings pitched at Misericordia showed some definite ability that could transition to the next level. Scouring his local area for tryout opportunities with major league organizations, Noyalis was able to perform for scouts with the Philadelphia Phillies and the Atlanta Braves, before reconnecting with Matt Anderson, a scout for the Blue Jays who have been following Noyalis since he was in high school. Impressed with the kind of talent Noyalis put on display in Texas. The organization quickly offered the 24-year old pitcher a contract. This is a moment that will live in the young pitcher forever, as it put him one step closer to his dream of pitching in the big leagues one day. While some fans are probably thinking that sounds like a long shot as Noyalis is just starting his professional career at 24. The righty features the velocity it takes to find success at the major league level. With the majority of pitchers throwing mid-90’s or higher in the show, Noyalis already fits the bill well if he can find continuous success at the minor league level. Another promising sign for Noyalis is his pitch repertoire. Already featuring four different pitches, the prospect is well on his way to keeping hitters off-balanced with his mix of pitches and speeds. Obviously a lot of questions will be answered for Noyalis when he reports to spring training. Not sure if he’s viewed more as a starter or a reliever at this stage of the process. The young pitcher looks forward to the challenge that his first spring training will present to him. The righty admits that he doesn’t know any of the guys yet that will be his future teammates. But he’s a fan of a pitcher that Blue Jays fans know well and he hopes to one day pitch alongside this promising star. With his first professional season fast approaching, Noyalis is excited for what’s ahead. Like many players, the righty has some definite goals that he would like to achieve before the conclusion of his 2016 campaign. Fans of the Toronto Blue Jays hope Gabe Noyalis can reach all the goals he has set out for himself this season and will one day achieve his dream of pitching in the big leagues. This guy should be parked beside Estrada and absorb as much as he can about the change up. The knuckle-curve sounds both potential devastating (in a good way and a bad way). He certainly has the velocity but how is his control and movement on the heater? The movement`s absolutely the question. We wish him luck, and hope to see him in Toronto one day! Great story we will be looking for you Gabe. I live north of Toronto I am trying to arrange a field trip with some of my buddies in June or July .I plan to hit 3 sites New Hampshire, Buffalo and Lansing.